Miami FL – The Miami Dolphins paid a visit to the Florida Keys Hurricane Irma evacuees at the Red Cross shelter in the Dade County Youth Fair Expo center. Prodoucher FunGus interviewed (see below) Miami native and former Miami Dolphins Wide Receiver Nat Moore. Nat believes this is “part of what we do” as a member of the Fins and the South Florida community. 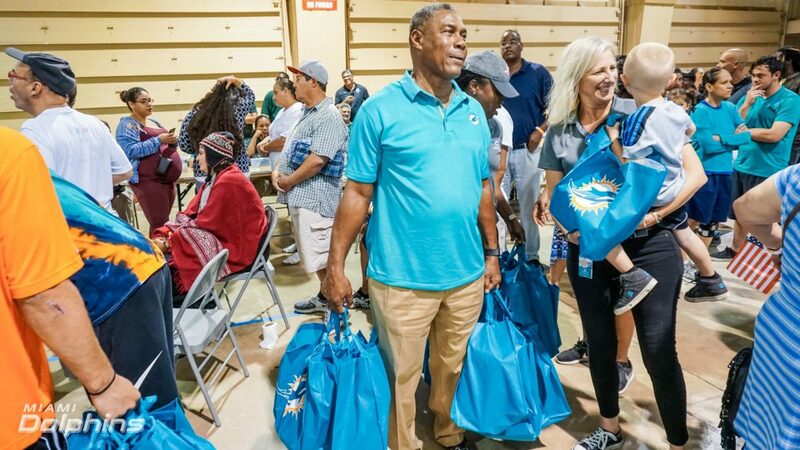 Along with AARP, The Miami Dolphins brought current players, such as Kenny Stills, Isaac Asiata, alumni, such as Nat Moore, Dolphins Cheerleaders, and other staff to help provide materials, meals, and water to evacuees. Aside from assisting as an organization, owner Steven Ross also personally pledged $1 million to hurricane relief efforts. Props to Nat Moore and the rest of the Miami Dolphins organization. For more info on how to help, please visit Dolphins.com/hurricanerelief.